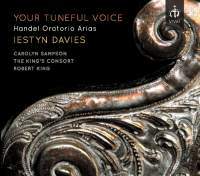 Many moons ago, Robert King and The King’s Consort recorded two enjoyably diverse Handel recitals with James Bowman (‘Heroic Arias’ and ‘English Arias’ – 12/91; 2/96), and they now revisit the latter’s concept with Iestyn Davies. Donald Burrows’s excellent booklet essay draws attention to how Handel performed these with different kinds of alto-range singers: women, castratos and, less often, countertenors. The neatly balanced programme also features a pair of duets featuring Carolyn Sampson and two orchestral interludes. Davies has recorded three numbers before (‘O sacred oracles of truth’ from Belshazzar, ‘Eternal source of light divine’ from the Birthday Ode for Queen Anne and ‘Yet can I hear that dulcet lay’ from The Choice of Hercules), but these sincerely sung and capably played performances add useful elements to the overall programme, which is unaccurately subtitled ‘Handel Oratorio Arias’ (there are arias from two odes and another from the secular classical drama Semele). Athamaus’s plaintive ‘Your tuneful voice’ elicits expressively nuanced singing from Davies and eloquent violin-playing from leader Kati Debretzeni. I enjoyed hearing some less obvious selections, such as Alexander Balus’s valorous trumpet aria ‘Mighty love now calls to arm’ (adapted from La Resurrezione) and Time’s pastoraltinged moralistic warning ‘Mortals think that Time is sleeping’ from Handel’s 1757 English rearrangement of his first Roman oratorio, Il trionfo del Tempo e del Disinganno (although the pulsing recorders might have lilted with a softer legato rather than the clipped rhythmical approach they incline towards here). The King’s Consort’s uncharacteristically dry strings are at the forefront of the close sound recorded in the Menuhin Hall – but Davies’s quick coloratura is dazzling in the final aria, ‘How can I stay when love invites’ (originally for tenor but adapted for Senesino in 1732).